In 2010, I produced my third episode of “Freedom School” with an actual group of people in London (the entire Freedom School series is available as a playlist on youtube, here) who were members or supporters of the political party I lead in Ontario, Canada: Freedom Party of Ontario (FPO). At one point during the session, the issue arose of what an FPO candidate or representative should call him/herself if he faces the “Are you liberal, conservative, libertarian?” question. My position then – as now – is that the candidate/representative should not call himself an “Objectivist” (which is a term referring to someone whose personal philosophy is that identified by author/philosopher Ayn Rand), but I didn’t get into why I held that position (the conversation went off in a different direction). Recently (see e-mails below) two Objectivists who have watched episode 3 of Freedom School have asked for my reasons. I’ve decided here to present, briefly, my reasoning against using the term “Objectivist” to refer to ones political orientation in an electoral context, and also to explain what a FPO supporter (and all others who share FPO’s views on the proper way to govern) should call himself. As a matter of describing my personal philosophy, I’d always say that I am an Objectivist. And, for all who are Objectivists and who are discussing their philosophy, I see nothing wrong with saying one is an Objectivist. However, electoral politics is not and – if you want to win – cannot ever be equivalent to a discussion about your philosophy. A political party’s purpose is not to change anyone’s philosophy (indeed, most people will live and die without ever even trying to identify the philosophy that is guiding their own decisions and actions) or to educate the public about philosophy. A political party’s purpose is to win seats and thereby to make government do what the party believes government should be doing. A party – every party – is a power-seeker that may or may not know what to do with the power once it is obtained. If a party’s policies or election planks are guided by a philosophy, that might be a good thing (depending upon the philosophy), but that does not mean that the party should go about pushing its philosophy. Instead, it presents – to the extent it is *electorally* advantageous – the results of applying that philosophy to the issues at hand. Were a political party a restauranteur, it would sell the tasty dish, not the recipe, and it would list only the dishes that would encourage people to enter the restaurant. Just as the restaurant’s patron wants good food rather than a piece of paper with instructions on how to make it, the voter wants good governance, not a course in philosophy. Metaphysical philosophy – Reality: physical nature, not the supernatural or fantastic, is the source of the information upon which a government must make its decisions. In the FPI logo, Reality is represented implicitly: we look to the stars, which are a part of nature. Epistemological philosophy – Reason: a government must make decisions that follow logically from the physical evidence at hand, and from the conclusions ultimately founded on that evidence. Reason is represented in the FPI logo by the first pointer star in the logo, on the outer part of the cup of the big dipper). Ethical philosophy – Self: the government’s purpose is not to make each individual his brother’s keeper, but to ensure that each individual can pursue his own happiness by rational means, if that is what he wants to do. Self is represented in the FPI logo by the second pointer star in the logo, on the outer part of the cup of the big dipper. Political philosophy – Consent: the government achieves its purpose by using force, or the threatened use of force, in the attempt always to ensure that no person is deprived of his life, liberty, or property without his consent. This political philosophy implies that the government will not do the very thing it is supposed to stop people from doing. For that reason, the government has no authority to interfere with consensual individual decisions concerning trade (i.e., our philosophy holds that there is a separation between economic decision-making and state, which separation is called “Capitalism”). Consent is represented in the FPI logo – *and* in the FPO logo – by Polaris, the final star at the end of the handle of the little dipper. I call that form of governance which sticks to reality, reason, self, and consent in its thinking and operations: “rational governance” or “objective governance”. Clearly, what I propose above is an adaptation of Ayn Rand’s philosophy, Objectivism, to the question: “How should a government govern?”. However, my answer to that question does not appear in Rand’s work – Rand wrote about the nature of the world, and about how an individual should think and act for himself, not about how a government should make decisions…indeed, she spoke primarily about what a government ought not to do, rather than about how it should make decisions – so I would not call what I outline above to be “Objectivism” per se. Incidentally, the difference between the FPI logo (which includes the big dipper) and the FPO logo (which does not, and instead includes the words “Life. Liberty. Property.”) is completely my fault. I designed both logos, starting with the FPI logo. At that time, I had not yet developed the relation between philosophy and government outlined above. In 2002, when I was asked to lead FPO, I wanted to do so only if the party was going to drop its overt promotion of philosophy, and instead present itself as an electoral vehicle (you will see the result of that in the 2003 election platform that I penned shortly afterward). FPI was created so that Freedom Party’s non-electoral activities (especially philosophical promotion/education, especially of our candidates) could continue without being part of FPO’s work. Indeed, I purchased two new domains – freedomparty.ca (for FPO’s federal counterpart) and freedomparty.on.ca – so that the electoral parties could have those domains, and FPI could use the freedomparty.org domain (which, formerly, was the FPO domain). Not yet having developed my view (expressed in brief above) about how metaphysics, epistemology, and ethics apply to government, governance, and government policy, I mistakenly thought – like libertarians and even most (almost all) Objectivists – that metaphysics, epistemology, and ethics have no direct relevance to government and, especially, have no direct relevance to electoral politics. Accordingly, I dropped the big dipper (which symbolizes epistemology and ethics and sets the metaphysical context relating those branches of philosophy to politics) from the FPO logo and replaced it with the political “rights” words “Life. Liberty. Property.”. Today, I probably would not have made the FPO logo differ from the FPI logo. In the context of a political party and electoral politics – as opposed to personal philosophy – I have a theory the conclusion of which is that (a) the supporter of a political party whose electoral planks and views on governance are guided by the above-outlined philosophy of rational governance (like FPO) needs a handle other than conservative, liberal, libertarian, etc. (none of which handles refer to parties, movements or philosophies favouring rational governance), and (b) “objective” is the best one. Just as we do not speak of liberalists and conservativists, we should not – in the electoral political party context – refer to ourselves as Objectivists. Objectivism is a personal philosophy and, as a political party, we are not promoting a personal philosophy, we are not trying to convert anyone, and, most importantly: not everyone who supports a party for rational governance would apply Objectivist philosophy to their own lives. Let’s take a particularly obvious example. A person might support Freedom Party because, as a result of our position on the funding of health care, we are implicitly opposed to taxpayer funding for abortions. That person might be attracted to the party by reason of that one plank alone, and might disagree with every other plank. The person might not (and probably won’t) know what philosophy is at all, never mind being interested in identifying or evaluating FPO’s philosophy. All Objectivists want rational governance, but not everyone who wants rational governance is an Objectivist. Moreover, not everyone who supports a party that is for rational governance will understand that philosophy or even realize that the party has a philosophy. Accordingly, a political party for rational governance needs a handle that even non-Objectivists can use without representing to others that they are, Objectivists. I submit that the best word is: objective. One is “objective” if one supports (in one way or another) a political party that knows what rational governance entails and that puts forward election platforms and policies toward the goal of achieving rational governance (as described above). Such a person is “objective” even if the party’s desire for rational governance is not the person’s reason for supporting the party. In the case of FPO: every individual who supports the party – for any reason at all – is “objective” not because it is the way he thinks, but because he supports a party that thinks governance should be rational (hence, objective). This is no different from “conservative” and “liberal”. Whatever the conservative and liberal parties are from time to time, those who support them are, respectively, “conservatives” and “liberals”. It is beyond the scope of what I want to discuss in this letter, but I will just add in response to R’s e-mail, below, that, yes, conservatives tend – in terms of epistemology and ethics – to be concrete-bound intrinsicists, and liberals tend to be floating-abstraction-bound subjectivists (see the video linked above), but my submission that FPO supporters should call themselves “objective” is not founded on the epistemologies or ethical philosophies of our supporters. Rather, it is founded upon the philosophy of the party itself. As with any electoral party, some who support FPO will be intrinsicists or subjectivists, but the party’s philosophy of governance is neither intrinsicist or subjectivist: it is solely objective. Those who support the party are supporting objective governance, whether they know what that is or not. And, because they support a party for objective governance, the supporters are right, in the context of electoral politics, to identify their political orientation as “objective”. Consider that, if I pay a man to deliver flowers to my spouse, I gave my spouse flowers every bit as much as he did. Whether she loves or hates receiving the flowers, it cannot be denied that I am responsible for giving them to her. If my subjectivist and intrinsicist neighbours elect members of a party guided by an objective philosophy, they too have delivered to the province objective governance – rational governance – and are responsible for having done so. They are, by their deeds, objective in the partisan/electoral sense, though not necessarily as a matter of their own personal philosophies. In his e-mail below, R refers to the awkwardness of saying “I’m an objective”. 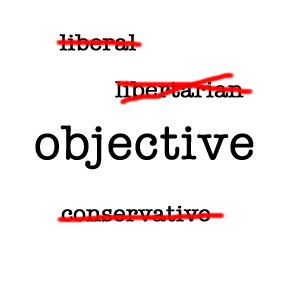 I agree that, at present, that phrase sounds awkward, owing primarily to the fact that the word “objective” is an adjective (or a noun, when at present it is used to refer to an aim or goal). However, “conservative” and “liberal” likewise are adjectives. “I am a conservative” is simply short for “I am a conservative person”. Over time – the fact that the person is a person being obvious and redundant – “I am a conservative person” has been shortened to “I am a conservative”: an adjective has been nounified. I trust that, were FPO supporters to go about – as I suggest they do – saying “I’m neither a conservative nor a liberal, I’m objective”, the same thing would happen over time: people would go about saying “He’s an objective, not a conservative or a liberal”. For now, any discomfort with using “objective” as a noun is easily dealt with: just say “I’m objective”. Finally: what if one does not live in Ontario and so cannot support FPO? No matter. “Objective” applies to FPO and its supporters because FPO’s stands on the issues are founded on a philosophy of rational governance. Likewise, everyone is “objective” who founds upon the above-outlined philosophy of rational governance their own positions on the issues faced in their own jurisdiction. I understand that there are Objectivists (Randroids) out there who bristle at the thought of someone calling themselves Objectivists if they might make the slightest error in judgement. You know of whom I speak. But I think Leonard Peikoff and Yaron Brook are much more forgiving in this area. To beat the point home we don’t call a subjectivist a subjective, nor do we call an intrinsisist and intrinsic. The only similar occurrence of calling someone an _____ive is a conservative. So for my part I will identify as an Objectivist (capital O). I appreciate that there are optics in the political realm to be considered. The press might have a field day calling those in our party [McKeever’s Note: negative word here omitted…the press doesn’t need any assistance with smears] a la Howard Roark (the usual misunderstandings) so to use the lower case might be preferable for our party. In an episode of freedom school you say we (political context) should be called “Objective” or “Objectives” and not “Objectivists”. I agree of course, buy say you would answer why in a minute, but you start talking about something else and never get back to that. I’m curious what you were going to say. I had been coming to a similar conclusion and I really appreciate the explanation. My own contemplation on this came when I was reading several, and responding to some, posts about people who have various non-Objectivist viewpoints but support the party. I was responding that, as long as you understand the concept of equal protection of everybody’s rights then what you do on your own time really isn’t that much of a concern. Indeed, it is the support of such a party that makes what you do on your own time that much more valuable and rewarding.